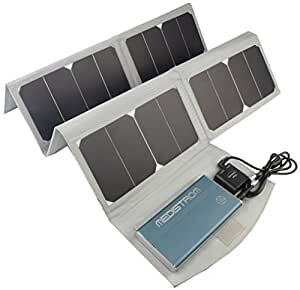 Package includes: Pilot-24 Lite CPAP Battery for ResMed AirMini and Airsense 10, Medistrom 50W Solar Panel, Charging Cable for Medistrom Pilot Lite, Output Cable for ResMed AirSense 10, Output Cable for ResMed AirMini, AC Adapter Cable for ResMed AirMini, Fabric Carry Case, Product Manual and Quick Start Guide. The New Medistrom Pilot-24 Lite is a revolutionary small Backup Power Supply/ Portable Travel Battery for ResMed Air Mini, AirSense 10, and other 24V PAP Devices. I is the smallest CPAP battery available on the market (size: 3.5 x 6.5 x 0.75 inches, weight: 1.3 lbs). It is compatible with most CPAP, APAP and some BiPAP 24V devices. Provides 1-2 nights of continuous run-time on an average CPAP pressure, average breathing rate, optimal mask seal and with the humidifier, heated tubing and exhalation pressure relief disabled. This kit includes a 50W Solar Panel. Charge time will vary based on weather and amount of available sunlight. Please make sure to place the Solar Panel in direct sunlight for optimal charge times. To be used only for charging, not intended to be used in the backup power supply configuration.